Dee mentioned Dale Carnegie and his comment about listening. Find more of his comments about the value of listening, here. Announcer: You’re listening to the Masterclass series from Essential Business Radio. Julie Stanford talks to the experts and in this program we hear from marketing expert Dee Blick and learn just how important it is to turn on the charm. Julie Stanford: Hello, Dee. Welcome back. Dee Blick: Hello, Julie. It’s great to be here again. Julie Stanford: I know that you have said that there has never been a more important time to focus on creating communications that are relevant and charming, and you’ve said that we’re living in an era where email is dominant, but it’s led to a lack of charm. What do you mean by that, Dee? Why is it so important to be charming? 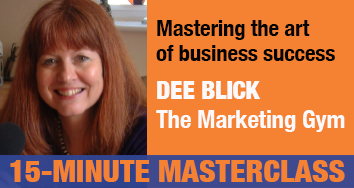 Dee Blick: What I mean is that I think we’re so lucky that on the one hand, we have all these great tools at the end of our fingertips. We’ve got email, we’ve got things like Twitter, social networking where we can fire off messages. We’ve got the power to almost publish and be damned our fingertips, which is wonderful but because we’re all in a rush, like little Mr. Rush in the series of the Mister Men. We’ve all become little Mr. Rushes. We’re actually not thinking that at the end of those messages that we are sending is something that we either want to do business with or somebody that we are doing business with, so consequently we’re firing off these rapid messages without really a thought as to the content, the tone. Does it actually reflect all the good and great stuff that we’re doing? We’re thinking, I’m in a hurry. I’ll fire off an email and hopefully that will do the trick, but we’re not actually engaging our brain before we send a communication or even create a communication and that’s a worrying, I see it as a worrying trend because so many businesses that I am working with when I review their communications, you can see all the hallmarks of this lack of charm. It’s let’s get the message out as quickly as possible without actually thinking about, we need to craft this message. If we were a bakery and we had out lovely bread in the front, we just had these lumpy bits of bread, they might all taste the same, they might taste beautiful. The cakes may be gorgeous but the fact that we’re just throwing the icing on, we haven’t bothered to paint the cupcakes, we’ve slapped it all on there. No, it’s good enough, it still tastes okay. People want charm, they want to be charmed, if we want to give our business to another business, we expect a degree of courting, old-fashioned courting and charm and there’s never been a better time in the current marketplace to stand out by being charming. Dee Blick: Definitely, and I think that that goes back to the power at the end of our fingertips. Just because you’ve got the power to publish what you like means you’ve got to be so much more careful about what you actually publish and you’re right, you see examples on Twitter. The other day there was a lady swearing on Twitter quite profusely and I thought, she wouldn’t have done that in a piece of literature, in a sales letter. She wouldn’t have done it in a flyer or a brochure but I think because a lot of us are testing out the waters online. It’s wonderful, we’re like kids in a sweet shop, we’re running amok without any discipline or any boundaries and we’re forgetting about the basic rule of communication. Julie Stanford: We’re all high on marketing sugar, are we, Dee? Julie Stanford: Right, so you know, one of the things I love about you, Dee, is that you always come on with these wonderful real life examples of people who, I’m assuming it’s going to be people who are charming. Julie Stanford: It will be easy to tell us about people who aren’t, but yes, tell us the real life examples that you’ve got that you always bring to these master classes. That’s probably the fairly charmless way that many businesses would go down that route, but what we wanted to do was to find out what was the message of relevance that’s really going to grab these dealers because relevance is at the heart of charm as well. If the message isn’t of relevance, nobody’s interested in it. This might sound like we’re going crackers here and sounding unprofessional but because we were very nice about it, very professional, the consequence was not only did the dealers tell us how they liked to be communicated with, out of nine calls that were made, eight actually said “Actually, we’d like to see you. Why don’t you pop in and discuss it with us.” It was kind of charming in that we were honest, we did it in an eloquent way, just confess it, that we weren’t quite sure how to market. Another example was a local electrical company wanted to target architects and again we were thinking, how do architects like to be communicated with? We had a fair hunch about case studies so what we did was organize a luncheon. We invited some architects to the luncheon. It was a beautiful venue of historical significance. Again, I think maybe a local café might not have had quite the same [frizz 00:06:14] on our impact, so we deliberately picked a venue for its gorgeous food and for its historical and architectural significance. We asked these guys, “We’d love to do work with you. Tell us again,” and be like the dealers, “Tell us how you like to be communicated with.” Low and behold, they do like case studies so we’re able then to craft really relevant case studies to be able to do business with them as part of that decision-making process. I can perhaps give you an example of me. Julie Stanford: Yes, why not. Dee Blick: I write for the Financial Mail Women’s Forum*, which is part of the Mail on Sunday. I used to go onto that website and gaze longingly at the contributors on them thinking I want to be on there too. Now, the way that most people would approach the journalist is to write to them and say “Can I please write for your website?” or “Here’s my press release,” but I didn’t do that. I played the long game, so I started to read the articles in detail that really appealed to me and only when I knew that I’d got great comments to make, would I respond to an article. Low and behold, an article came up about being an author and story-telling and I thought that’s the one that I should respond to. I spent about 20 minutes explaining why I enjoyed reading the article. The journalist contacted me and to cut a long story short, I now actually write for the Financial Mail Women’s Forum. I always think that there’s two ways of doing things with our sales messages. We can dive in there, be really quick, rapid, fire off our email. Hey, we’ve ticked the marketing box that’s marked ‘activity’ but we haven’t ticked the marketing box that marks ‘effective’. Often, it’s about standing back and thinking, “What message should I really carry to that person?” because we’re still dealing with people at the end of it, aren’t we? Not big faceless organisations, but what message can I carry to that person that will be relevant and charming. Julie Stanford: We always, in the last five minutes, of our masterclasses, we always really focus, don’t we, on the ‘how’. So, exactly how can we bring in the charm? Julie Stanford: We’re awash with what we should be doing, but this is intriguing to me, Dee, because the underlying thing you’re saying here is not only about charm, it’s about being human. It’s being fallible, not having to be perfect. When we all start in business, we have this strange sense of ourselves that we have to be perfect. We can’t show any cracks to our customers or to anybody out there and actually, the thing that often, as human beings we find engaging and endearing is when people do show their human side. Dee Blick: You’re so right. I’ve got this little phrase about you can be perfectly imperfect and passionate. You know what, if you’re passionate about your business and you are willing to share that passion and listen to others as well about their passion, it’s amazing what connection can be made. If we look at perhaps the building blocks of charm, which I think you were saying is how, how do we do it? First of all, something that I touched upon in a previous masterclass was to know what it is that we are offering. That’s about having out little benefits statement. What benefits have we got to offer? If you go into your little marketing toolkit, it should be bursting with benefits, and if they’re all written down, that’s a great start. I think then it’s isolating the benefits that are relevant to the person that you want to communicate with. The journalist that I was writing to for Financial Mail, I impressed upon her my writing abilities, the fact that I’m a published successful author. She wasn’t interested in the work that I’d just done with the Blue Chip brand helping them to market their security systems, so I think don’t bore people with all of the benefit messages. Look at that little benefit statement and pick out the ones that you think are going to really have relevance and meaning to the person that you’re delivering your charming message to. That’s the first thing is your building block is your benefit statement. Second aspect is think about storytelling. As kiddies, we loved the story the once upon a time, then at the end how we all hopefully lived happy ever after. Think about your story and write it down, because your story’s what puts the sparkle in the eye, makes the heart beat that little bit faster of the person that you’re speaking to. If you’re telling them that you started your business against the odds, that you have this burning desire to really help people, that you built onto your experience, your qualifications, all little nuggets that really count in this charm assault that your actually going to bring to bare. You’ve got your benefit statement, you’ve got your story. How long? About a paragraph. How many benefits? If you’ve got 15 juicy benefits that you’ve got written down, it enables you to be a little bit concise. You’ve got a paragraph that tells your story. Avoid hype and overplaying superlatives. What do I mean by that? You don’t have to hype that you’re the best marketer or the best bookkeeper, because people don’t always want the best marketer in the world and even so, if you’re saying that, they’ll be very dubious of you so know what your strengths are. I think the whole point of being charming is about a little bit of humility. It’s being able to say, “Actually, that’s not an area in which I’m experienced, so you may want to speak to somebody else. In this area, I am really experienced.” It’s knowing your own assets. Do a bit the stock take of your own assets, your own experience and again, commit it to paper. How often do we do that? We’re stuck when we’re asked for it we do or we trying to communicate with somebody, with don’t have that lovely little anchor of all these benefits of our bullet points of what we offer and so forth. I often call this in marketing a little plus one model. What’s the one extra thing that I can do to make a positive impact on that person? What’s the one genuinely charming thing I can do? Now we’re almost moving from the written word into how we conduct ourselves. What impact do we want to leave on people? I hope that’s helped. It’s kind of a mixture of writing down the benefits, really looking at where we’re relevant, getting our little story in there, making sure we keep it updated, then looking at how we communicate and how we can add that layer of old-fashioned etiquette to our communications. Julie Stanford: You said in one of the other master classes something that I thought was really crucial, which was listening. If you’re listening to the other person as well, the things you’re saying back are going to be more likely to be charming because it’s going to be a conversation rather than a lecture. There’s going to be charming as opposed to smarmy, really. Isn’t it? That’s the point of listening as well, is to make it a two-way thing. Dee Blick: You know what, Julie? I think you just put a great phrase there, charming not smarmy. I’m going to have to remember that, that’s a great one [inaudible 00:13:51] next blog, don’t be smarmy, be charming. I think it was Dale Carnegie who said that the greatest gift you can give somebody is to be able to listen with intent, rather than just hear what they’re saying before you dive in. Julie Stanford: That’s where the art of marketing comes in, isn’t it? Julie Stanford: As always, fantastic stuff. Thank you very much, Dee, for your 15-minute Marketing Masterclass. Dee Blick: Thank you, Julie. *2015 update: The Financial Mail Women’s Forum website is no longer available.